ACTIVE KIDS ARE HAPPY KIDS! Trampoline games keep them busy for hours! This game is played just like regular soccer but the ball doesn’t go flying! Choose the edges of each goal by using the uprights on the trampoline, use a soft ball and go to town! Remember to use only your feet or your head. Reset after each goal. Spread some stuffies or pillows around your trampoline, then jump around being careful not to touch the stuffies. One player is the egg & forms a tight ball in the middle of the trampoline. The other player tries to make the egg open up by jumping near them. If the egg opens up or the jumper touches the egg the game is over. Start some high energy music. Players jump while tossing the ‘potato’ (a soft ball or teddy) back & forth. Who ever has the ‘potato’ when the music stops is out. One player does their favourite Trampoline move, the next player has to copy the original move and then add on one of their own. The next player repeats all the moves in the sequence and adds one of theirs at the end. Continue adding on one player at a time until someone forgets the next move. Start again from with the beginning with a different player beginning the sequence. Players square off in a head to head contest of who can do the most bum-drops in a row. Also try and beat your own score for time or number of drops! 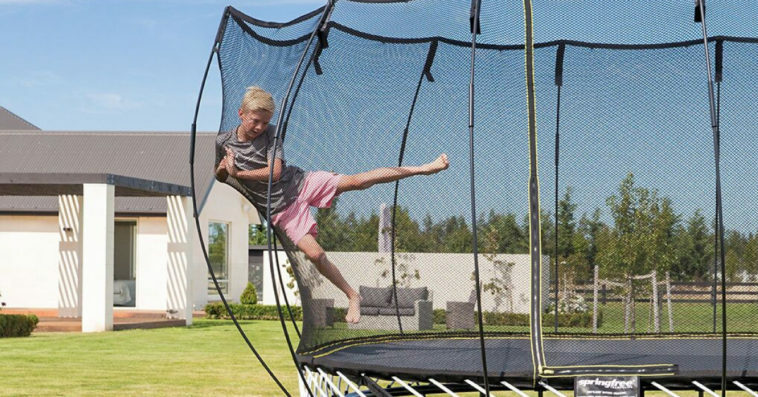 Do your kids have favourite trampoline games? We’d love to see them in action and we love how safe they are on a Springfree Trampoline! My little guy is still young but I think we could make the bum drop contest happen! OMG..the girls would love either soccer or the poisonous stuffies! Poisonous Stuffies would be a favourite! Love the game hot potato! Our son would definitely love spring free soccer! Definitely Poisonous Stuffies! I loved Crack an Egg as a child! My kids would go crazy for poisonous studies since we are so stuffy crazy over here! My kids would love springfree soccer. My kids would love to play hot potato! It’ll be a toss up between poisonous stuffies and trampoline soccer! Love the hot potato game! I think my boys would love the Spring free soccer game. Poisonous stuffies would be popular here. We are all about crack the egg around here! My kids would love to play crack the egg. Poisonous stuffies sounds like FUN! !